Brainwave applications for iOS are quite popular. These apps are quite handy for those who want to use sound therapy to calm their body down, meditate, get rid of pain, and even increase their focus. Of course, not all brainwave apps are created equal. Some of these come with a limited selection of brainwaves. That is not the case with Brainwave Tuner HD. It is a sophisticated application that allows you to achieve all kind of states with its tunes. 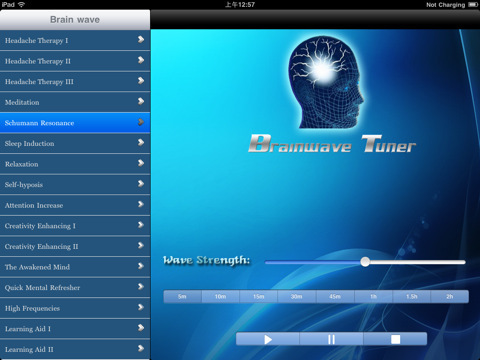 Brainwave Tuner HD comes with 19 wave patterns to get you started. Some of these brainwaves can be used to get rid of your headaches and relax your body. There are some that can make you more productive, increase your focus, enhance your creativity, and even put you to sleep. Brainwave Tuner HD does not have a super complicated interface. Just choose the effect you want to achieve and go! 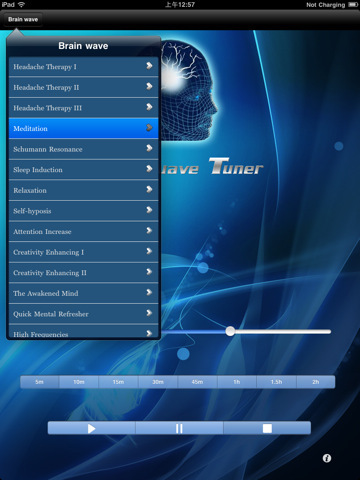 Brainwave Tuner HD is well worth trying if you are looking for a brainwave app that could do more than just putting you to sleep. Waves strength can be adjusted easily too. Not a bad option if you want to get better control of your state of mind.